The Arboretum has received increasing numbers of inquiries for recommendations for native species of milkweed to benefit declining monarch butterflies populations, and as alternatives to planting the widely available tropical milkweed (Asclepias curassavica). 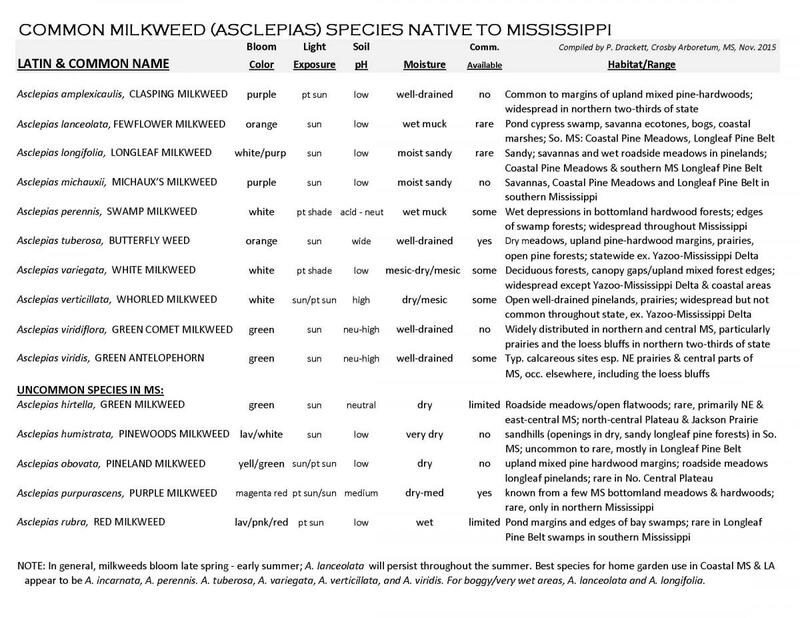 In spring 2015, we asked Dr. Wayne Morris of Troy University, AL to compile a list of milkweed (Asclepias) species native to Mississippi. Dr. Morris assisted MSU botanist Dr. Sidney McDaniel with the plant inventory of Crosby Arboretum and its associated natural areas. 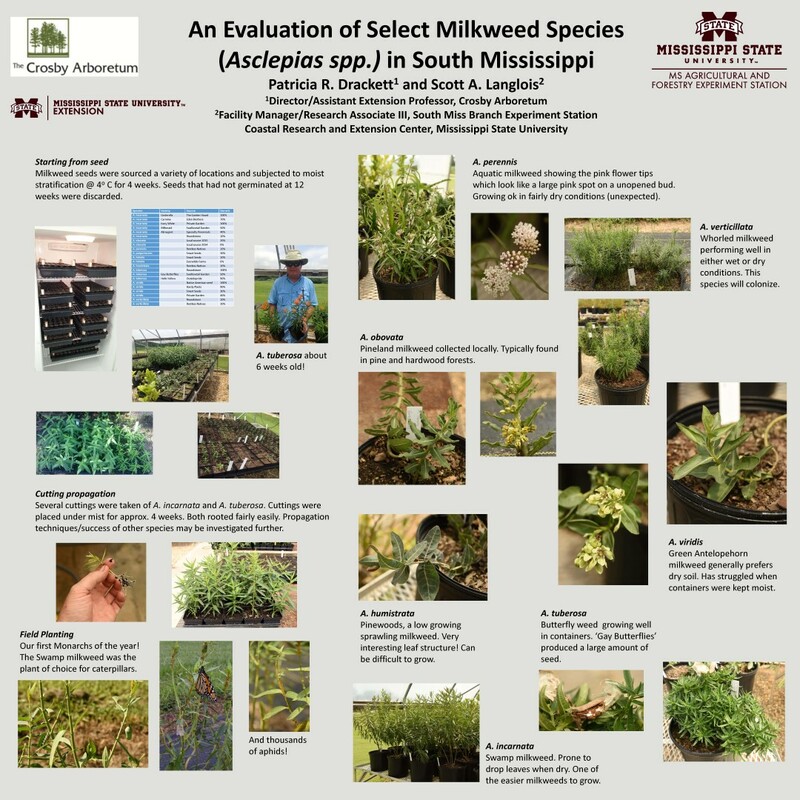 “Mississippi Milkweeds” Poster & Information Sheet – Based on Dr. Morris’s list, a poster was compiled illustrating 15 Mississippi milkweed species and presented at the 42th Annual Ornamental Horticulture Field Day in October 2015 at the South MS Branch Experiment Station, Poplarville, MS, along with an information sheet listing the species’ environmental preferences. 2016 Milkweed Seed Trials – In late 2015, seed was obtained by Patricia Drackett for many of these 15 species, mostly from out of state sources. Field trials began in early 2016 at the Experiment Station to determine the native milkweed species best-suited for home garden use, with field trials and container trials conducted by research associate Scott Langlois (MSU-CREC). Garden trials took place in the Crosby Arboretum’s pollinator garden and by Pearl River Master Gardeners in their home gardens. Results were summarized in a poster presented at the 43rd Annual Ornamental Horticulture Field Day in October 2016 at the Experiment Station. 2017 Milkweed Seed Trials – Native seed from Mississippi milkweed populations was collected in 2016 by Pat Drackett and planted out on February 24 with assistance from Pearl River County Extension Agent Dr. Eddie Smith for the current garden trials at the Poplarville Experiment Station, being conducted by research associate Scott Langlois. Results will be presented at the 44th Annual Ornamental Horticulture Field Day on Thursday, October 5, 2017. 2018 Milkweed Seed Trials – Sources of Mississippi milkweed seed are being sought for next year’s garden trials. 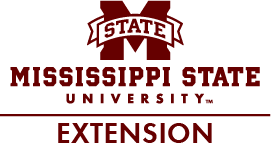 If you have seed you would like to submit for the trials, please contact pat.drackett@msstate.edu. At the Crosby Arboretum in Picayune, our goal is to one day be able to provide home gardeners with a variety of native milkweed that is propagated from coastal Mississippi sources. 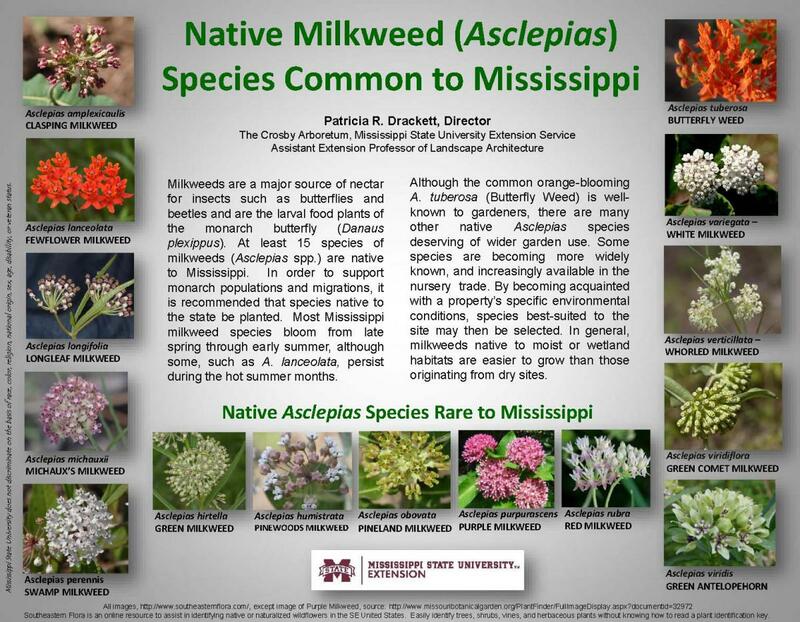 A Mississippi Milkweeds Facebook page was established in April 2017 to help locate sources of seed from Mississippi Asclepias populations and to facilitate the exchange of information about native Mississippi milkweeds, such as plant identification, sources of plants and seed, reports of propagation successes and failures, awareness of area planting projects, and to forge connections between persons of all knowledge levels exploring the propagation and cultivation of Mississippi milkweed. Asclepias species occurring at the Crosby Arboretum, Picayune: A. lanceolata, A. longifolia. Asclepias species found at the Arboretum’s Hillside Bog Natural Area, Hancock County: A. michauxii, A.obovata. Asclepias species currently growing in the Crosby Arboretum’s Pollinator Garden: A. incarnata, A. perennis, A. tuberosa. Asclepias species grown in 2016 at the South MS Branch Experiment Station: A. hirtella, A. humistrata, A. incarnata, A. obovata, A. perennis, A. purpurascens, A. tuberosa, A. verticillata, A. viridis.